It may be stretching a point to provide a ‘tales from the towpath’ where we had to catch a combination of trains and tubes to get to this gig, but hey, this is London after all – and unless you’re going to Dingwalls you really shouldn’t expect to float to a gig. The crowd might have been a bit sparse for a Saturday night but a whole bunch of people had decided to spend another two hours of life watching Germany win on penalties after extra time. Clearly, in a week of surprises no doubt a predictable, nay, inevitable outcome was a comfort to some. But those who did so missed a storming, uplifting Saturday night out. And that, in essence, is what City Funk Orchestra are about. From the get-go you just know you’re in safe hands. Within the first half a dozen songs we’ve had a slick, uptown “Back Together Again” where the blend of voices paid genuine homage to Donny Hathaway and Roberta Flack, Patrice Rushen’s “Forget Me Not” featuring some real ‘period’ bass playing from the absolutely imperious Rick Mitra, a great version of “Love TKO” which took the pace down briefly before the first set ended with a very acceptable “Ain’t Nobody”. The voices of Noel McCalla and Louise Warren matched each other beautifully, even if Noel was occasionally a little bit found out when ‘doing’ Barry White. Quite simply, he’s very competent in the lower register but he’s absolutely astonishing and has a genuinely soulful intensity when he heads up the scale. By the same token Louise was astonishing when she let fly at Aretha’s ‘Rock Steady’ but seemed a little at sea on material which perhaps needed a little more control such as Sister Sledge’s “Thinking Of You”. High points of the set for me were a warm and sinuous version of Luther Van D’s “Never Too Much” and a crowd-pleasing “I’ve Found Lovin” which really rolled back the years for many of the assembled. As already alluded to, the rhythm section of Rick Mitra and Geoff Dunn never missed a beat. Guitarist Nial Tompkins showed he was equally at home playing the funky scratch you need for the likes of “Good Times” alongside occasional pyrotechnic lead fills, and Gary Sanctuary on keyboards had his hands full providing the depth and breadth of backing needed to ‘trick’ the assembled into not missing a horn section – which is probably the main thing that was missing. But you can only review what is there – and what was there was enough to have the floor full of dancers and a room full of smiley Saturday night. 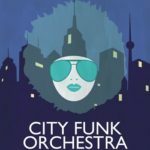 City Funk Orchestra go out there and Do The Deed. They really are a party on legs. The set may have been a tad predictable but what did you want for your money? And to be fair they were considerably less predictable than Germany on penalties.